Over the course of 12 years of working in the customer service industry and successfully meeting the needs of my clients, Sherica has developed a commitment to customer care. She was raised on the foundation of an entrepreneurial spirit and taught the value of being diligent, trustworthy and dedicated. After graduating from University of Central Florida in 2010 with a BS in Health Service, Sherica pursued her dream of becoming a homeowner and since then has achieved this goal twice. 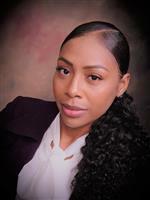 Sherica has gained much knowledge in the home buying and selling process and now able to tailor her attention to your unique real estate transaction. Sherica has an energetic spirit and a go getter attitude. She’s a loving mom with a big appetite for travelling and experiencing culture. She prides herself in customer satisfaction and values integrity.